Copyright Jimoto All Rights Reserved. Jimoto, a Nagano-based company working to help revitalize local communities by promoting local businesses and products, added new items produced in three areas of Nagano Prefecture (Kitashinshu, Nakashinshu, and Minamishinshu) to its gift catalog lineup in February 2014. Jimoto's gift catalogs each contains around ten items--apples, rice, and vegetables, for instance--produced by farmers in Nagano. The catalogs are designed to mimic a set of ten postcards, with each card bearing a photo of the producer on the front and a thoughtful comment from the producer about the item on the back. Gift catalog recipients choose the items they like and send the cards to the company to receive the items at the height of their respective seasons. 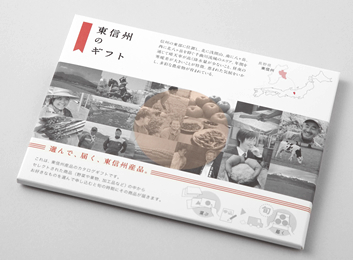 Products featured in the catalogs are sold with the intention of introducing people to towns in Nagano and encouraging them to eat Nagano cuisine. Customers use them as wedding favors, midsummer and year-end gifts, and baby gifts. The gift items are also sold through the website as well as at gift shops and variety stores in Tokyo and Nagano. Jimoto also added items produced in Nambu in Aomori Prefecture, Hidatakayama in Gifu Prefecture, and Bingo District in Hiroshima Prefecture to its gift catalog lineup in April 2014. The company plans to continue expanding the geographical reach of its business.